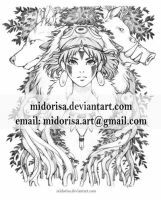 Edit: I'm sorry I had to add the watermark but people have been stealing my art . So it is there at least for now. 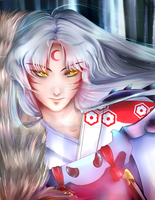 A Sesshomaru Fan art from InuYasha. One of the first series I started to watch and read during my long art hiatus. I hadn't drawn for many years and had kind of forgotten my childhood dream of becoming an artist. This series gave me inspiration to pick my pencil again and I've drawn and practiced since then, as I had found the inspiration to create again. I'm really grateful to all of the great artist around the world working in different fields, comics, animation and painters for the inspiration they have given me during these years. Also, Rumiko Takahashi's mangas were the first ones I ever read as a child. This was actually an old sketch I found when I was browsing my old paintings from my old PC I found. I decided I would finish this and see how much I had improved in an year or so. Sometimes it fun to finish sketches and ideas you thought you never finish . Tools/programs: Paint Tool SAI, some PS CS6. Edit1 : I was seriously surprised today when I woke up and noticed that this was awarded a Daily Deviation! And it's the first one I ever received! Thank you so much, I feel so honored and amazed and overwhelmed! I surely couldn't expect that coming so thank you to MentalCinephile and TsaoShin who first suggested and featured this! Edit2: I must write an another one just because I'm so amazed by all the positive feedback and attention I've received suddenly and all the people that decided to watch me after the DD. I'm quite speechless. Thank you! I'll continue to do my best for you guys! Please don't share without my permission. If you share on tumblr or on other social media, share it through my official page or link back properly and give credit, thanks! Thank you! I remember that I worked hard on this back then and especially changed his face a lot. So I'm happy you think so! Can I share this from here to my Tumblr blog, KagomeForever? It'll credit you and it'll link back here, of course. Awesome! I didn't know you have a Tumblr, that's even better. Thank you! Beautiful work on him! For the special effects, do you prefer to use custom brushes or do you paint them on directly? Like the glowing specks around him and the moon. Thanks you! With this I remember I painted all by hand with a few different brushes in SAI. But surely using customized brushes would make the process much faster and If I had to work really fast then those would be handy. It's slow of course making it from the scratch but as my main software is still SAI, I've grown used to it and making the best of it's limited brushes and sometimes i'm just too 'lazy' to switch to photoshop when painting. I'm trying to learn to become as comfortable as I'm with SAi with photoshop as well though. Here I remember I used some hard basic round brushes (details) , some round 'water tool' for the blur effect and then some glow later with round airbrushes, I adjusted the density levels of the brushes as well and made multiple layers. Thanks for the info! It makes sense you created the effect with standard brushes. I think sometimes it's better to start by doing things the 'hard way' so one doesn't rely too much on software without understanding the process and basics. Of course it is faster that way, so if you have deadlines and such or had to create a huge number of them the brushes will be really efficient that way. I use SAI and Photoshop too, so I also try working with both programs. especially if you're still very much learning the basics for example. There's also a danger of getting a bit too exited with custom brushes and using them way too much. They're the icing on the cake, not the cake itself, to me at least. no harm in using custom brushes here and there if you want. LOL That's hilarious And I agree. I saw some brushes online shaped like an entire solar system and moon shaded in, but usually if you use those kind of brushes they end up looking quite flat and out of place in the picture. I think it's better to use brushes for texture and effects, rather than replacing entire parts of the artwork. Agreed, they can make your artwork look sort of "artificial" and flat if used badly. If the custom brush style clashes with your other painting, it will just look out of place. be careful and remember not use those brushes for commercial work, if the brushes license forbids that. filters and color correction options are much wider in PS. I can understand that. Photoshop definitely has superior photo editing capabilities than SAI, and more brush variation. Although I prefer the painting process in SAI, since SAI's software works more like real painting - when you apply a color over another, it sort of 'blends' like traditional painting. I think Corel is like that too. Photoshop tends to 'stamp' colors on top of one another by default. In SAI I do like the bristle brush for painting hair though to give it that texture. It's why I see several artists use Sai (or Corel) for drawing/painting, then Photoshop for touch ups/custom brushes. I have adopted that method for now, too. You can sort of emulate the SAI's blend brush inPS as well, using the mixer brush with different settings and brushes. That's what I would use to blend if I didn't use SAI, together with airbrush and lowering the opacity of my brushes. gotten myself to paint anything big with it. I've also tried Corel painter when it was available for trying purposes for one month. produce anything decent with it, I would need to spent weeks just to learn to use the software itself and get comfortable with it. panels so that they wouldn't bother me . But as I'm most comfortable with sai and then photoshop, I'll stick to those for now as well. This detailing and the color and the shadows! This is utterly beautiful. Clearly you have a ridiculous amount of talent. Happy you like it! I'm working hard on my art, so thank you! Huh? I though I'd be watching you since suggesting the DD … Fixed that! Thank you, happy to hear that! You made him look so amazing! I liked the character but wasn't always a fan of how he was drawn, so it's nice to see a rendition that looks like what he should be! Thanks you so much! I tried to give him the appearance that I thought he would look in semi-realistic style. I captured some of his character! Sesshomaru-chan!!!!!!!!!! Yes!! Thank you so much!!!!!!!!! Fantastic job and congrats on the DD! Awesome job! I love Inuyasha. It has some of the best theme songs ever! Thank you! The soundtrack includes some really good and atmospheric theme songs, I agree! Thank you! I feel honored to have it . You're welcome, it is well deserved.